Sarasota may be known for its sugar sand beaches, but the city along the Gulf of Mexico is also a premier destination for championship golf with the award-winning Ritz-Carlton Sarasota Members Golf Club in Lakewood Ranch. 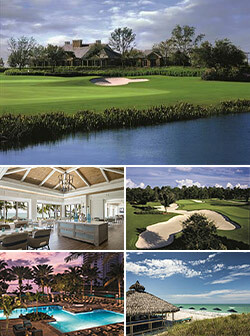 Available to guests of The Ritz-Carlton, Sarasota and members of the club, players are provided with one of the Gulf Coast’s top golf experiences - from an 18-hole championship golf course for single and group play, customized instruction, and experiences off the course such as The Members Grille. Located 13 miles from both the resort and Sarasota airport, The Ritz-Carlton Golf Club offers a Tom Fazio-designed 18-hole championship course with a par 72 layout that provides a fair and memorable test of golf. With a Certified Audubon Cooperative Sanctuary designation, the scenic course has been strategically sculpted to contour and frame each hole that gracefully rolls among the 12 picturesque lakes. Known as The Lions Den, the last three holes of The Ritz-Carlton, Sarasota Golf Club are recognized as three of the hardest consecutive holes in Florida – joining the ranks of other famous groups of holes such as The Snake Pit at Copper Head and The Bear Trap at PGA National. Complete each hole in par or better and the player will receive a shirt from the golf shop to celebrate the achievement. Along with a challenging course that puts any level of player to the test, The Ritz-Carlton Golf Club offers instruction through private individual lessons and customized group clinics, along with family golf incorporating kids play and special programs and camps. For more information on the golf experience, tee times, and transportation for The Ritz-Carlton Golf Club, please visit www.ritzcarlton.com/sarasota or call (941) 309-2900.